This vibrant castle is suitable for kiddies up to age 14 and comes with a rain / sun cover so you can keep bouncing despite the typical British weather. Like all of our items this castle has been recently tested and safety approved. If this castle is already booked out, check out the 12 x 14 Red & Yellow version. The bouncy castle blowers need to plug into a standard electric power supply. We will bring extension cables in case they are needed, but these shouldn't be used to cover distances over 50m. If your event is in a field or large garden where there is no nearby source of power, we can supply a generator or a petrol blower at an additional cost. You can click here to view these, or call us on 07994 487 578 to discuss this further. This is one of our most popular Kids Party Castles. 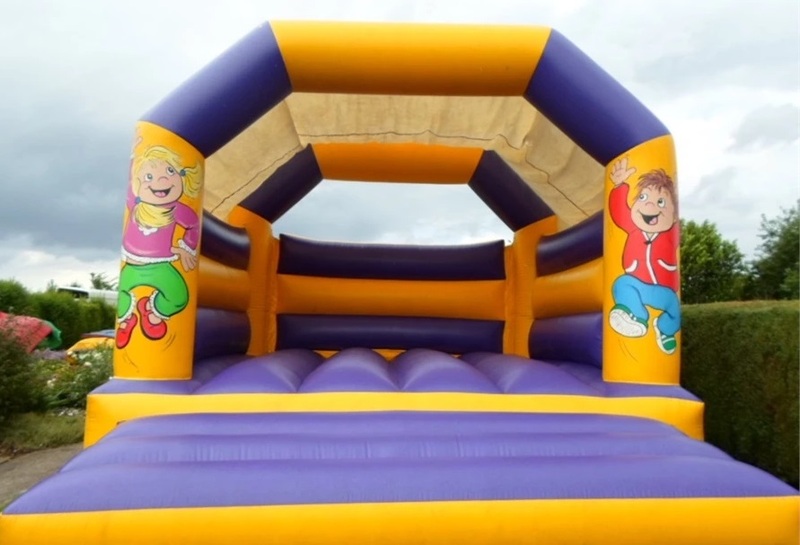 If you would like to see a smaller version of a similar castle, please click the following link for the 10 x 12 Red & Yellow Kids Party Bouncy Castle. These units can also be used indoors, as long as there is enough room. Please check the ceiling height, or speak to us via phone or email if you have any questions. We have a list of popular indoor venues in Huddersfield here. If the rain starts while using the inflatable, we ask that you cover the electric plug sockets with plastic bags to avoid any water damage. You can leave the caste inflated during light showers to allow the rain to run off easily, drying it out quickly. If the castle is deflated, it may become waterlogged and take a longer time to dry out. You should also wipe off any surface water with an old towel, and take extra care on the steps while the inflatable is drying out. If there is heavy wind, please turn off the castle straight away.